By allowing website owners to easily earn revenue from ad placements on their sites, Google AdSense has significantly simplified the unrewarding task of selling that ad space. At Supermetrics we understand that in order to make smart, data-based decisions, publishers need to track and analyze AdSense data wisely — a task absolutely critical for maximizing ad revenues. 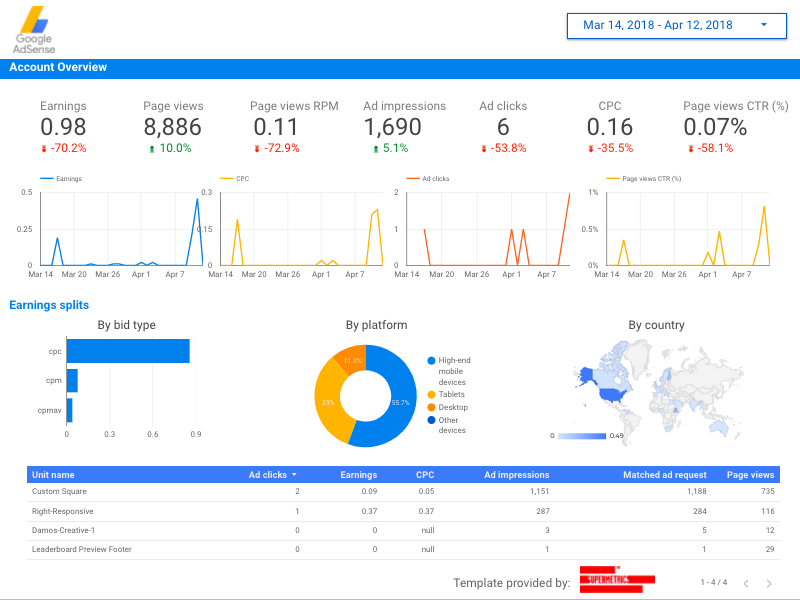 Now we’re making AdSense analysis and reporting a piece of cake: Supermetrics proudly presents an AdSense connector for Google Sheets and Google Data Studio to help publishers dramatically simplify tracking and reporting of AdSense data! In this blogpost, we will provide an in-depth overview of how to do AdSense reporting with Supermetrics and how it can help your business. Here is an outline of the post. Feel free to skip the first part if you’re already familiar with AdSense metrics and dimensions. You can also report the CTR (click through rate) and RPM (revenue per thousand impressions) for some of those metrics on both the page level as well as the ad unit level. On the ad unit level, you could choose to report Page views, Ad impressions, Ad requests and Matched ad requests CTR/RPM. Next, let’s quickly cover some of the main dimensions by which you can break down metrics and go through why it is important to have them in your dashboard. There are several types of ad formats in AdSense: text, image, flash, rich media and animated image. From your report you can compare the formats against each other to evaluate which ad format is performing best. Custom channels is a grouping of ads, which helps “guide your efforts” in becoming profitable with AdSense. This grouping helps you analyze if a certain combination of size, placement and content is performing well. For example, you will learn whether a 728×90 leaderboard ad positioned at the top is bringing you more revenue than a small 180×150 rectangle on the side. Not only can you report on the earnings of each custom channel, you can also see all the other metrics (CPC, Matched ad requests, Ad requests and others) for each of your channels. According to Google, targeting type is “the manner in which an advertiser targeted ads at your website”. There are several targeting types, and your report will help you assess how successful each is working on your website. Now we have discussed which main metrics and dimensions you can see in the AdSense UI. There are a number of ways you can make the ads on your website more successful. However, the most popular route is to find the winning combination of different ad placements, styles and sizes. In the following sections we will go through the features lacking in the AdSense UI and show how you can build an actionable report yourself. AdSense offers only two types of default reports: Home tab dashboard and Performance reports. To get a full picture, here’s how the reports are structured in the AdSense UI, we will discuss their contents and, most importantly, their limitations. On the very first tab of the AdSense UI you will see a dashboard which is separated into sections. Each section focuses on specific metrics, some broken down by a particular dimension. For example, the “Performance” tab contains six key metrics as well as their trendlines, and the “Platforms” part reflects earnings broken down by platform. The Home tab report is great in helping you get a general overview of your AdSense account performance. However, this report has several significant limitations. Firstly, you only have five pre-set date range options for each section of the dashboard. In addition, for some of the charts you can only report on data from the last six months. For other charts, the maximum date range is within the most recent 30 days. Kind of a problem if you want to see longer-term trends. Chart options in the report are also predefined. For example, if you choose the bid type breakdown, the data will appear in the form of a pie chart, and you will not be able to switch to a sparkline to see the main trends for the earning from each bid type. Performance reports are more flexible than the Home tab reports. Here, you can report historical data for an unlimited time range, choose a date range of any length, or use the filter to view the report for a certain segment. However, these reports have a significant constraint: they only allow you to select one dimension at a time. In practice, that means if you want to break down metrics by different dimensions, to find the winning combo to maximize your ad revenues, or want to see charts with multiple dimensions, you would need to switch between different tabs. This back and forth switching between tabs becomes inconvenient if you have to look into the data frequently and compare reliably. This is where Supermetrics comes to the rescue. You can report your AdSense data without any limitations of the AdSense UI! For those of you without a lot of experience analyzing AdSense data, the number of available metrics and dimensions can look so overwhelming that you might have difficulty choosing which ones to include in your dashboard. So we decided to create a few templates to give you a jumpstart. One important feature of these templates is that it is extremely easy to customize them to your specific needs. This Google Sheets dashboard will show you how your key metrics are performing. The “General Overview” part covers the most important metrics and their trendlines. Below the main metrics you will see the earnings breakdown – by bid type, platform type and ad unit. The second part features the breakdown of five main metrics by Format, Custom channel, Targeting type and Ad unit size. This will help you easily see how ads are performing on each of these dimensions and make tweaks to maximize the revenue. If you would like to use this template, simply add it from Supermetrics Google Sheets template gallery and connect your accounts. After that, you may change the template according to your needs. If you do not have Supermetrics Google Sheets add-on, you can start your free trial here. 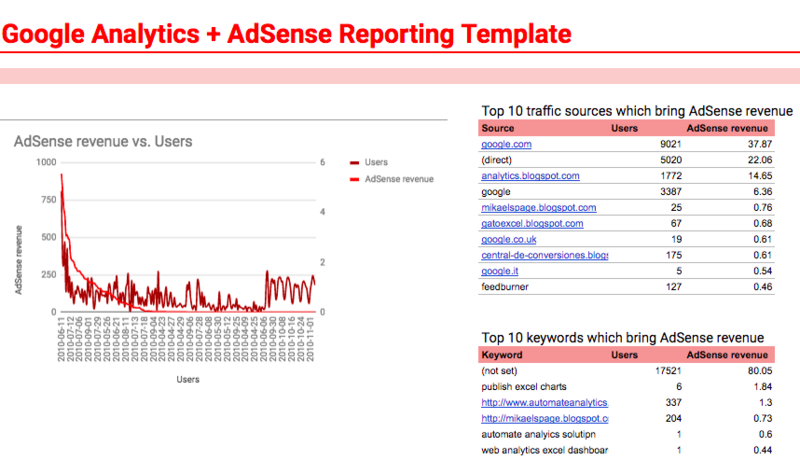 Similarly, you can easily build AdSense reports in Google Data Studio. 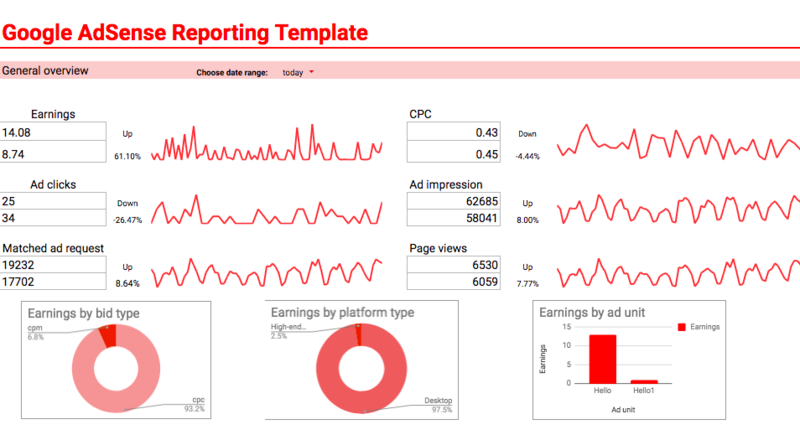 Our default AdSense reporting template, available with the AdSense Data Studio connector provides a clear visualization of key metrics. In the table at the bottom, earnings are split by bid type, platform and country. You can track how individual ad units are performing from the table. This dashboard is perfect to be used as the “default” report to get an overview of your account performance on a regular basis. To get this dashboard, select “Use template by default” in the bottom of the connector’s account selection page after you have selected the ad clients. In this post on the Google Analytics blog, Daniel Waisberg has a neat summary of the power of integrating AdSense with Google Analytics and reporting AdSense metrics in Google Analytics. Nevertheless, in Google Analytics, you’re again limited to a handful of pre-set reports and data visualization options. With our Google Analytics integration, you could pull your AdSense data into Google Sheets or Google Data Studio to get better flexibility for reporting. You can get the dashboard from Supermetrics add-on’s Template Gallery as well. To make the most out of AdSense, you need to have proper reporting in place. While AdSense native UI offers a number of reporting options, it lacks flexibility in terms of reporting historical data, date range selection and ability to keep all the charts with breakdown dimensions on one screen. Supermetrics AdSense connector helps overcome these limitations of the native interface and in addition allows blending of AdSense data with metrics from multiple other platforms to gain even more insight. Our top-notch AdSense reporting templates will help you get started in better measuring your AdSense metrics and optimizing the revenue. 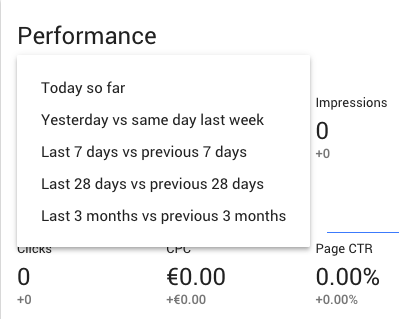 If you’re new to Supermetrics, you can start your free trial of Supermetrics for Google Sheets here or try our AdSense connector for Google Data Studio by clicking this link.